The Database Deployment Toolkit provides a simple and efficient editor for the database structures. 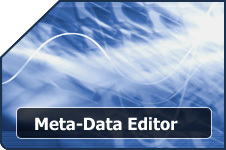 The editor maintains a meta-data profile that may contain one or more databases. The Database Deployment Toolkit has a feature rich and intuitive meta-data editor. This editor allows the developer or database administrator to create the desired data structure. The meta-data editor allows all of the structures to be created without the need for the Enterprise Manager or SQL Management Studio. In many cases, an application has more than one database that is used. The Database Deployment Toolkit allows an unlimited number of databases to exist within a single profile. This means that all databases can be deployed and/or updated with a single deployment package for an application. An unlimited number of SQL Servers can be updated with the same meta-data package. This is especially important for any developer who needs to deploy an SQL Server data structure more than once. Any developer who installs to more than one client site needs this tool. It takes all of the frustrations out of deploying SQL Server databases, especially for commercial applications. The Database Deployment Toolkit is ready out-of-the-box with many advanced features that would normally require vast T-SQL knowledge and expertise. But when using the DDT, these features can be implemented immediately without knowing or understanding how it works from an SQL Server point of view. INSERT, UPDATE, and DELETE stored procedures can be automatically created and deployed without writing a single line of T-SQL code. Simply check a box and the procedures will be created and deployed automatically. This allows a developer to take full advantage of the speed performance achieved when using the INSERT and UPDATE stored procedures without having to manually program them. Additionally, these created procedures can be seamlessly used in conjunction with the CRUD settings on the business objects in the Application Framework. The Database Deployment Toolkit includes a history of deleted and renamed objects. Any database, table, or column can be renamed and the DDT will rename the object during the structure deployment. This feature enables developers to break free from being “locked” into a poorly named element; if the table was misnamed and deployed, it can be changed. 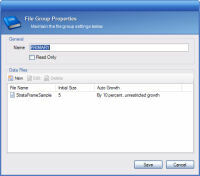 Complete file group and data file support exists within the Database Deployment Toolkit. When a table is created, it is associated with a file group. Additionally, multiple data files can be specified per file group. Each data file has the ability to be controlled by the developer or database administrator including the growth, size, and file attributes. This is beneficial for a number of reasons. First, tables within the same database can be stored in different physical files. An example of why this may need to be done would include read-only or static data. If the database is going to contain tables that are only changed during the update and cannot be edited or deleted, then these tables may be associated with a read-only file group. This increases performance since these tables will operate in read-only mode. Managing the indexes and relationships within the DDT is very easy and supports all features available within SQL Server 2000 and 2005. This includes clustered indexes, cascading deletes and updates, fill factors, relationship enforcement, and more. One very nice feature of the DDT is automatic primary key index creation. Since the primary key is specified through the table structure editor, when saved, the primary key index is automatically created saving the developer or database admininstrator valuable time. The Database Deployment Toolkit supports stored procedure editing and deployment for those times when manual T-SQL code needs to be written. Though the DDT provides extensive automated stored procedure creation, we know that there are times more advanced developers and database administrators need to create custom T-SQL stored procedures. The view editor is simple in design but rich in features and support. Using regular expressions, all defined views will appear within the Database Deployment Toolkit with the data field column as well as the table it belongs to making it very easy to view the structure results of a defined view. One powerful tool that SQL Server provides are user-defined functions. As such, when creating applications that will need to take advantage of all of the tools that SQL Server provides, user-defined functions can become a must. The Database Deployment Toolkit now fully supports user-defined functions as part of the meta-data deployment. SQL Server 2005 made some excellent improvements on different data types. One of these improvements are the MAX data type fields. The MAX data type allows large variable length fields to reside in the same physical file on disk and ultimately will replace the Text and Image types. All new types are supported by the Database Deployment Toolkit. There is even a preference to keep developers and database administrators from using the old technology, which is advised on new data structure creation because the Text and Image types are no longer available in SQL Server 2008. In SQL Server 2008 a number of new data types were introduced. Most of these built on other data types, but these data types include DateTime2, DateTimeOffset, Time, and Date as well as several others. 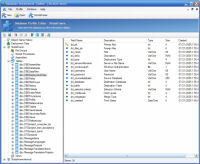 In addition to new data types, FILESTREAM is also support which allows a VarBinary(MAX) field to be extended by storing the contents of the file outside of the SQL Server database on the server which prevents the consumption of the database size while still allowing for standard queries to be performed against the field as though the data were stored within the database. This is great for users taking advantage of the Express editions since there are database size limitations. All of the editors have been designed for ease-of-use and speed. As such, most developers and database administrators can create meta-data profiles out-of-the-box with little or no explanation (though there is complete documentation). The Database Deployment Toolkit provides a fast and simple solution for both deploying and designing the SQL Server data structures. 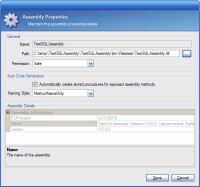 With the advent of SQL Server 2005, .NET assemblies can be written to process data directly on the server. Before 2005, the only way to do this was with T-SQL code. This benefits the developer because all of the code can be written in VB.Net or C# and then called through a stored procedure and executed on the server. Once the assembly has been written there is still the difficult task of deploying the assembly to the server and then communicating with the assembly. The Database Deployment Toolkit makes this an effortless task. Simply select the assembly and it will be registered with the server when deployed. Additionally, stored procedures will be automatically created that allow you to interact with the assembly. The Database Deployment Toolkit seamlessly integrates with the Application Framework side of StrataFrame. The DDT can be launched directly from the Visual Studio IDE environment. CRUD settings can be easily set to directly interface with the automatically generated stored procedures and deployed CLR assemblies. When mapping business object structures using the Business Object Mapper, the schema or structure can be pulled straight from a Database Deployment Toolkit profile. The profile does not even need to deployed to a server in order for the structure to be associated. A side benefit of "non-deployed" data schemas is the ability to create "ghost" profiles that allow business objects to be strong-typed with a data structure even though that structure will never be deployed. This is beneficial when creating business objects that will use an XML file as a data source. Once imported, the structure can be immediately modifed and deployed. The import procedure does more than just import structures, it also helps databases such as FoxPro migrate smoothly to SQL Server by automatically converting data types to the appropriate SQL data type. There are also conversion options to improve database performance and functionality as well.